(CNN) -- Jacqui Read loves to hike with Buddy on the weekends. 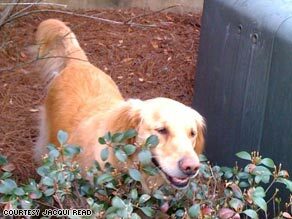 Buddy, a golden retreiver, is allergic to pollen, creating a challenge during hikes around his Atlanta neighborhood. In the spring, they can spend a whole day exploring the outdoors near their Atlanta, Georgia, home. When they return home, they enjoy a nice meal and an evening on the sofa. But if it's been a bad day for pollen, Read breaks out the Benadryl. Two for her -- and three for Buddy. Buddy, the 75-pound golden retriever, has allergies. "I grew up with goldens. That's why I adopted him, and I don't remember us ever having dogs with allergies," she said. "But I had never heard of that, so when they said I could give him Benadryl, I was like, 'Really?' "
"Allergies we cannot cure. We just manage them and keep them under control so the animal can have a good quality of life," she said. Diaz said the most common kind of allergies, especially in dogs, is a reaction to fleas. The saliva from a flea bite can irritate an animal's skin. Jacquie Smith, who lives in Washington with her boyfriend and five cats, works hard to prevent Ben, a gray tabby, from having flea issues. She uses a flea control product called Frontline, but every now and then -- especially when the weather gets warm -- Ben's hair will fall out near his tail. It's a telltale sign of the flea allergy that Ben has while his brother Jerry has no similar symptoms. "At first we thought it might be stress," Smith said. "But the vet did a skin scraping test [for mites] and figured out it was a flea allergy. Just one flea can make him lose his hair." Diaz said that although fleas are the most common cause of allergies, environmental factors (pollens, molds, grasses) also often lead to skin problems, as well as food allergies (to certain proteins or carbohydrates). Animals typically don't get runny noses or watery eyes. Instead they get itchy skin that they will bite or lick. Sometimes people overlook allergies, believing that scratching is normal behavior, she said. And another often disregarded sign is an ear infection, which most dogs with allergies get. "With allergies, they tend to get worse with time," Diaz said. "They are very seasonal. Animals often get very itchy, say in spring and in fall, and then they get significantly better." Allergies are on the rise in humans and in animals, said Cliff Bassett, an allergist/immunologist with the Long Island College Hospital of Brooklyn, New York. He blamed the increase of carbon dioxide in the air as one factor. Because of higher CO2 levels, plants produce three to four times more pollen, and it's stronger than in previous years. The best way to protect yourself or your pet is to stay away from the source of the irritation. "Whether you are an animal or an adult, the primary prevention is to avoid the allergen," he said. Diaz said it takes many weeks to determine whether an animal has a food allergy. 1. Start the pet on a new food, and watch for allergic reactions to it for eight to 10 weeks. 2. If there are no reactions, feed the pet with the original food. If the symptoms return, Diaz said, the diagnosis is a food allergy. 3. If you want to figure out which ingredient was the culprit, your veterinarian will provide you with more new food, this time with one ingredient that was also in the old food. If the pet has no reaction after a few weeks, you can add a second ingredient, and so on until the allergen is discovered. With allergies unrelated to food, veterinarians can do tests on dogs and develop vaccines to treat the problem, Diaz said. The vet will use environmental allergen charts for the region to determine the likely cause. Then the doctor will inject a suspected allergen into the skin and then observe the pet's reaction. The test takes about 30 minutes, and the animal will need to be sedated, she said. "We develop a specific vaccine for each case," she said. "Each individual case will be managed differently." Diaz recommended several different measures to lessen the effects of allergies. She suggested vacuuming often if pets are allergic to mites, or limiting their outdoor time when pollen counts are at their highest (mornings or evenings). Frequent bathing is good for removing allergens from the skin, she said. Read, who is a writer for the Centers for Disease Control, said she was going to take Buddy to the vet once more because he has been really itching this spring and his eyes have been more "goopy" than usual. And his ears seem to need more scratching on those weekend nights on the couch. "I just want to make sure that there isn't any more I can do," she said.